The 5 Series MSO offers better visibility into complex systems by offering four, six and eight channel models with a large 15.6″ high definition (1,920 x 1,080) display. 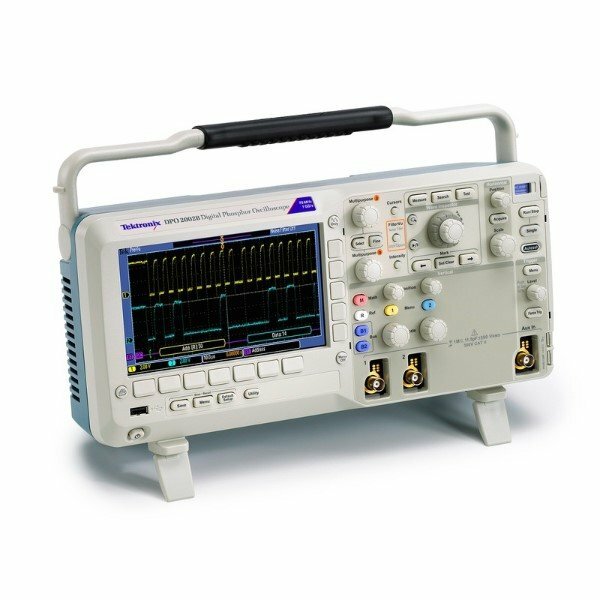 Many applications, such as embedded systems, three-phase power electronics, automotive electronics, power supply design, and DC-to-DC power converters, require the observation of more than four analog signals to verify and characterize device performance, and to debug challenging system issues. And while you might assume that a six and eight channel scope would cost 50% or 100% more than a four-channel scope, you’ll be pleasantly surprised to find that six channel models are only ~25% more than four channel models and eight channel models are only ~67% more than four channel models. The additional analog channels can pay for themselves quickly by enabling you to keep current and future projects on schedule. The 5 Series MSO redefines what a Mixed Signal Oscilloscope (MSO) should be. FlexChannel technology enables each of the inputs on the instrument to be used as a single analog channel or eight digital channels. The conversion is done by simply attaching a TLP058 logic probe to any input. Imagine the flexibility and configurability this provides. With an eight FlexChannel model, you can configure it to look at eight analog and zero digital signals. Or seven analog and eight digital. Or six analog and 16 digital, five analog and 24 digital and so on. You can change the configuration at any time by simply adding or removing TLP058 logic probes, so you always have the right number of digital channels. The 5 Series MSO offers a new level of integration of digital channels. Digital channels share the same high sample rate (up to 6.25 GS/s) for fine timing resolution, and long record length (up to 125 Mpoints) for long time captures as analog channels. Previous-generation MSOs required tradeoffs, with digital channels having lower sample rates or shorter record lengths than analog channels. Color-coded digital traces make it easy to determine if a logic signal is a one or a zero, even when the trace is flat across the display. Ones are displayed in green and zeros in blue. Unique multiple-transition detection hardware indicates when more than one transition occurs within a sample interval. A white bar on the trace indicates that more information is available by zooming in or acquiring at faster sampling rates. Often, zooming in will reveal a glitch that was previously hidden. Distinct thresholds can be defined for each digital channel, enabling you to easily observe different logic families, unlike other MSOs that have one or two shared thresholds across all digital channels. The stunning 15.6″ (396 mm) display in the 5 Series MSO is the largest display in the industry, providing 100% more display area than a scope with a 10.4″ (264 mm) display. It is also the highest resolution display, with full HD resolution (1,920 x 1,080), enabling you to see many signals at once with ample room for critical readouts and analysis. To make each waveform visible, you vertically scale and position each waveform so that they don’t overlap. Each waveform uses a small percentage of the available ADC range, leading to less accurate measurements. The new Stacked display eliminates this tradeoff. It automatically adds and removes additional horizontal waveform ‘slices’ (additional graticules) as waveforms are created and removed. Each slice represents the full ADC range for the waveform. All waveforms are visually separated from each other while still using the full ADC range, enabling maximum visibility and accuracy. And it’s all done automatically as waveforms are added or removed! Channels can easily be reordered in stacked display mode by dragging and dropping the channel and waveform badges in the Settings bar at the bottom of the display. Groups of channels can also be overlaid within a slice to simplify visual comparison of signals. Viewing three analog channels, eight digital channels, a decoded serial bus waveform, decoded serial packet results table, four measurements, a measurement histogram, measurements results table with statistics and a search on serial bus events – simultaneously! Scopes have included touch screens for years, but the touch screen has been an afterthought. 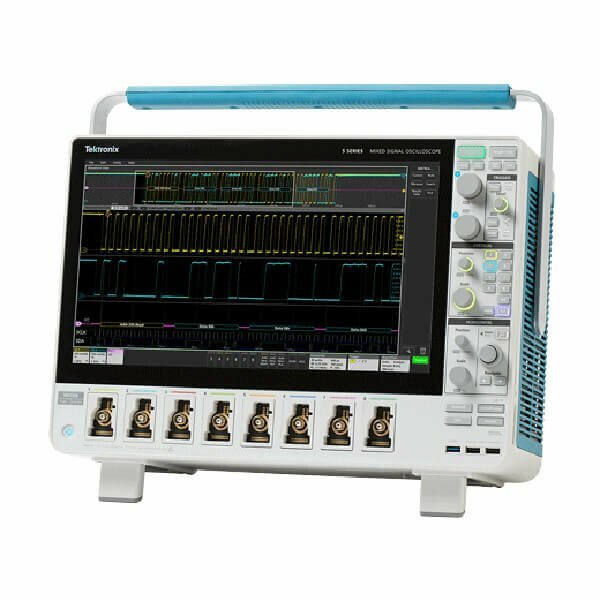 The 5 Series MSO’s 15.6″ display includes a capacitive touchscreen and provides the industry’s first oscilloscope user interface truly designed for touch. Interact with the capacitive touch display in the same way you do on your phones and tablets. Traditionally, the front face of a scope has been roughly 50% display and 50% front panel. The 5 Series MSO display fills about 85% of the face of the instrument. To achieve this, it has a streamlined front panel that retains critical controls for simple intuitive operation, but with a reduced number of menu buttons for functions directly accessed via objects on the display. Color-coded LED light rings indicate trigger source and vertical scale/position knob assignments. Large, dedicated Run/ Stop and Single Sequence buttons are placed prominently in the upper right, and other functions like Force Trigger, Trigger Slope, Trigger Mode, Default Setup, Autoset and Quick-save functions are all available using dedicated front panel buttons. Efficient and intuitive front panel provides critical controls while still leaving room for the massive 15.6″ high definition display. The 5 Series MSOis the first oscilloscope to offer you the choice of whether to include a Microsoft Windows™ operating system. Opening an access panel on the bottom of the instrument reveals a connection for a solid state drive (SSD). When the SSD is not present, the instrument boots as a dedicated scope with no ability to run or install other programs. When the SSD is present, the instrument boots in an open Windows 10 configuration, so you can minimize the oscilloscope application and access a Windows desktop where you can install and run additional applications on the oscilloscope. Or you can connect additional monitors and extend your desktop. Whether you run Windows or not, the oscilloscope operates in exactly the same way with the same look and feel and UI interaction. 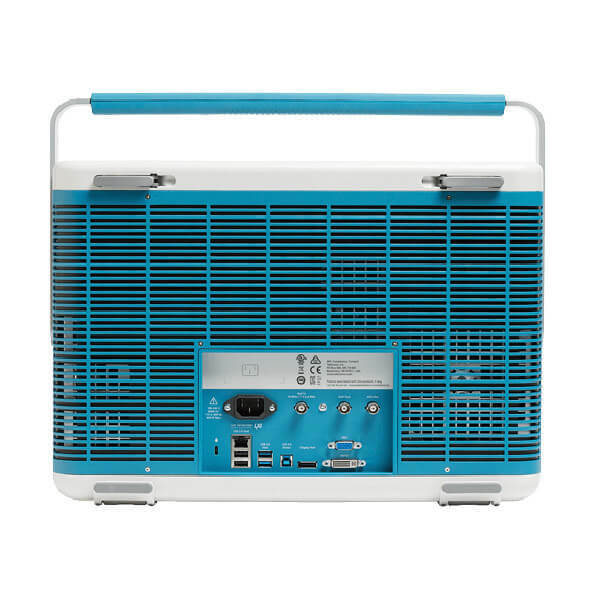 The 5 Series MSO is also available in a low-profile form factor – the MSO58LP. With eight 1 GHz input channels plus an auxiliary trigger input, in a 2U high package and 12-bit ADCs, the 5 Series MSO Low Profile sets a new standard for performance in applications where extreme channel density is required. With up to 2 GHz analog bandwidth, 6.25 GS/s sample rates, standard 62.5 M record length and a 12-bit analog to digital converter (ADC), the 5 Series MSO has the performance you need to capture waveforms with the best possible signal fidelity and resolution for seeing small waveform details. To debug a design problem, first you must know it exists. Digital phosphor technology with FastAcq provides you with fast insight into the real operation of your device. Its fast waveform capture rate – greater than 500,000 waveforms per second – gives you a high probability of seeing the infrequent problems common in digital systems: runt pulses, glitches, timing issues, and more. To further enhance the visibility of rarely occurring events, intensity grading indicates how often rare transients are occurring relative to normal signal characteristics. FastAcq’s high waveform capture rate enables you to discover infrequent problems common in digital design. The 5 Series MSO provides the performance to capture the signals of interest while minimizing the effects of unwanted noise when you need to capture high-amplitude signals while seeing smaller signal details. At the heart of the 5 Series MSO are 12-bit analog-to-digital converters (ADCs) that provide 16 times the vertical resolution of traditional 8-bit ADCs. A new High Res mode applies a hardware-based unique Finite Impulse Response (FIR) filter based on the selected sample rate. The FIR filter maintains the maximum bandwidth possible for that sample rate while preventing aliasing and removing noise from the oscilloscope amplifiers and ADC above the usable bandwidth for the selected sample rate. High Res mode always provides at least 12 bits of vertical resolution and extends all the way to 16 bits of vertical resolution at ≤125 MS/s sample rates. New lower-noise front end amplifiers further improve the 5 Series MSO’s ability to resolve fine signal detail. The 5 Series MSOs 12-bit ADC along with the new High Res mode enable industry leading vertical resolution. With up to a 125 Mpoint record length, you can capture many events of interest, even thousands of serial packets in a single acquisition, providing high-resolution to zoom in on fine signal details and record reliable measurements. The wide variety of trigger types and context-sensitive help in the trigger menu make it easier than ever to isolate the event of interest. Visual Trigger extends the 5 Series MSO’s triggering capabilities by scanning through all waveform acquisitions and comparing them to on-screen areas (geometric shapes). You can create an unlimited number of areas using the mouse or touchscreen, and a variety of shapes (triangles, rectangles, hexagons, or trapezoids) can be used to specify the desired trigger behavior. Once shapes are created, they can be edited interactively to create custom shapes and ideal trigger conditions. Once multiple areas are defined, a Boolean logic equation can be used to set complex trigger conditions using on-screen editing features. Visual Trigger areas isolate an event of interest, saving time by only capturing the events you want to see. By triggering only on the most important signal events, Visual Trigger can save hours of capturing and manually searching through acquisitions. In seconds or minutes, you can find the critical events and complete your debug and analysis efforts. Visual Trigger even works across multiple channels, extending its usefulness to complex system troubleshooting and debug tasks. Multiple channel triggering. Visual Trigger areas can be associated with events spanning multiple channels, such as triggering on a specific burst-width on channel 1 and a specified bit pattern on channel 2. The TPP Series passive voltage probes included with every 5 Series MSO offer all the benefits of general-purpose probes — high dynamic range, flexible connection options, and robust mechanical design, while providing the performance of active probes. Up to 1 GHz analog bandwidth enables you to see high frequency components in your signals, and extremely low 3.9 pF capacitive loading minimizes adverse effects on your circuits and is more forgiving of longer ground leads. An optional, low-attenuation (2X) version of the TPP probe is available for measuring low voltages. Unlike other low-attenuation passive probes, the TPP0502 has high bandwidth (500 MHz) as well as low capacitive loading (12.7 pF). 5 Series MSOs come standard with one TPP0500B (350 MHz, 500 MHz models) or TPP1000 (1 GHz, 2 GHz models) probe per channel. The TekVPI®probe interface sets the standard for ease of use in probing. 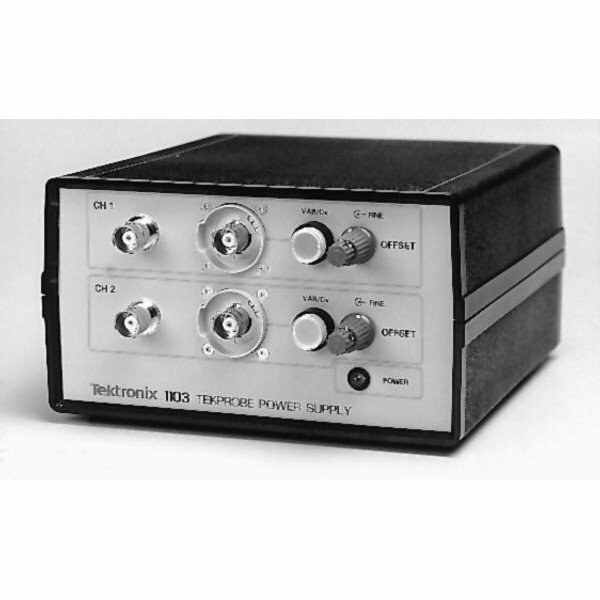 In addition to the secure, reliable connection that the interface provides, many TekVPI probes feature status indicators and controls, as well as a probe menu button right on the comp box itself. This button brings up a probe menu on the oscilloscope display with all relevant settings and controls for the probe. The TekVPI interface enables direct attachment of current probes without requiring a separate power supply. TekVPI probes can be controlled remotely through USB or LAN, enabling more versatile solutions in ATE environments. The 5 Series MSO provides up to 80 W of power to the front panel connectors, sufficient to power all connected TekVPI probes without the need for an additional probe power supply. Whether designing an inverter, optimizing a power supply, testing communication links, measuring across a current shunt resistor, debugging EMI or ESD issues, or trying to eliminate ground loops in your test setup, common mode interference has caused engineers to design, debug, evaluate, and optimize “blind” until now. The Tektronix TIVM Series IsoVu™ Measurement System offers a galvanically isolated measurement solution to accurately resolve high bandwidth, differential signals up to 2,500 Vpk in the presence of large common mode voltages, with the best in class common mode rejection performance across its bandwidth. Verifying that your prototype’s performance matches simulations and meets the project’s design goals requires careful analysis, ranging from simple checks of rise times and pulse widths to sophisticated power loss analysis, characterization of system clocks, and investigation of noise sources. FastFrame™ Segmented Memory enables you to make efficient use of the oscilloscope’s acquisition memory by capturing many trigger events in a single record while eliminating the large time gaps between events of interest. View and measure the segments individually or as an overlay. Measurement results tables provide comprehensive statistical views of measurement results with statistics across both the current acquisition and all acquisitions. Using automated measurements to characterize power supply bring up. Finding your event of interest in a long waveform record can be time consuming without the right search tools. With today’s record lengths of many millions of data points, locating your event can mean scrolling through literally thousands of screens of signal activity. The 5 Series MSO offers the industry’s most comprehensive search and waveform navigation with its innovative Wave Inspector®controls. These controls speed panning and zooming through your record. With a unique force-feedback system, you can move from one end of your record to the other in just seconds. Or, use intuitive drag and pinch/expand gestures on the display itself to investigate areas of interest in a long record. The Search feature allows you to automatically search through your long acquisition looking for user-defined events. All occurrences of the event are highlighted with search marks and are easily navigated to, using the Previous ( ← ) and Next ( → ) buttons found on the front panel or on the Search badge on the display. Search types include edge, pulse width, timeout, runt, window, logic, setup and hold, rise/fall time and parallel/serial bus packet content. You can define as many unique searches as you like. You can also quickly jump to the minimum and maximum value of search results by using the Min and Max buttons on the Search badge. Earlier, FastAcq revealed the presence of a runt pulse in a digital data stream prompting further investigation. In this long 20 ms acquisition, Search 1 reveals that there are approximately 37,500 rising edges in the acquisition. Search 2 (run simultaneously) reveals that there are six runt pulses in the acquisition. During debugging, it can be invaluable to trace the flow of activity through a system by observing the traffic on one or more serial buses. It could take many minutes to manually decode a single serial packet, much less the thousands of packets that may be present in a long acquisition. And if you know the event of interest that you are attempting to capture occurs when a particular command is sent across a serial bus, wouldn’t it be nice if you could trigger on that event? Unfortunately, it’s not as easy as simply specifying an edge or a pulse width trigger. Triggering on a USB full-speed serial bus. A bus waveform provides time-correlated decoded packet content including Start, Sync, PID, Address, End Point, CRC, Data values, and Stop, while the bus decode table presents all packet content from the entire acquisition. The 5 Series MSO offers a robust set of tools for working with the most common serial buses found in embedded design including I2C, SPI, RS-232/422/485/UART, SPMI, CAN, CAN FD, LIN, FlexRay, SENT, USB LS/FS/HS, Ethernet 10/100, Audio (I2S/LJ/RJ/TDM), MIL-STD-1553, and ARINC 429. Serial protocol search enables you to search through a long acquisition of serial packets and find the ones that contain the specific packet content you specify. Each occurrence is highlighted by a search mark. Rapid navigation between marks is as simple as pressing the Previous ( ← ) and Next ( → ) buttons on the front panel or in the Search badge that appears in the Results Bar. Parallel buses are still found in many designs. The tools described for serial buses also work on parallel buses. Support for parallel buses is standard in the 5 Series MSO. Parallel buses can be up to 64 bits wide and can include a combination of analog and digital channels. Serial protocol triggering lets you trigger on specific packet content including start of packet, specific addresses, specific data content, unique identifiers, and errors. Bus waveforms provide a higher-level, combined view of the individual signals (clock, data, chip enable, and so on) that make up your bus, making it easy to identify where packets begin and end, and identifying sub-packet components such as address, data, identifier, CRC, and so on. The bus waveform is time aligned with all other displayed signals, making it easy to measure timing relationships across various parts of the system under test. Bus decode tables provide a tabular view of all decoded packets in an acquisition much like you would see in a software listing. Packets are time stamped and listed consecutively with columns for each component (Address, Data, and so on). A key focus area for embedded designers is testing various embedded and interface technologies for compliance. This ensures the device passes the logo certification at plugfests and achieves successful interoperability when working with other compliant devices. The compliance test specifications for high speed serial standards like USB, Ethernet, Memory, Display and MIPI are developed by the respective consortiums or governing bodies. Working closely with these consortiums, Tektronix has developed oscilloscope-based compliance applications that not only focus on providing pass/fail results but also provide deeper insight into any failures by providing relevant measurement tools such as jitter and timing analysis to debug failing designs. Complete test coverage per the specification. Fast test times with optimized acquisitions and test sequencing based on customized settings. Analysis based on previously-acquired signals, allowing the device under test (DUT) to be disconnected from the setup once all acquisitions are completed. This also allows analysis of waveforms acquired on a different oscilloscope or captured at a remote lab, facilitating a very collaborative test environment. Optional signal validation during acquisition to ensure the right signals are being captured. Additional parametric measurements for design debug. Custom eye diagram mask testing for insight into design margin. Detailed reports in multiple formats with setup information, results, margins, waveform screen shots and plot images. The TekExpress USB 2.0 automated compliance testing configuration menu. The 5 Series MSO has seamlessly integrated the DPOJET Essentials jitter and eye pattern analysis software package, extending the oscilloscope’s capabilities to take measurements over contiguous clock and data cycles in a single-shot real-time acquisition. This enables measurement of key jitter and timing analysis parameters such as Time Interval Error and Phase Noise to help characterize possible system timing issues. Analysis tools, such as plots for time trends and histograms, quickly show how timing parameters change over time, and spectrum analysis quickly shows the precise frequency and amplitude of jitter and modulation sources. Option 5-DJA adds additional jitter analysis capability to better characterize your device’s performance. The 31 additional measurements provide comprehensive jitter and eye-diagram analysis and jitter decomposition algorithms, enabling the discovery of signal integrity issues and their related sources in today’s high-speed serial, digital, and communication system designs. Option 5-DJA also provides eye diagram mask testing for automated pass/fail testing. The unique Jitter Summary provides a comprehensive view of your device’s performance in a matter of seconds. The 5 Series MSO has also integrated the optional 5-PWR/SUP5-PWR power analysis package into the oscilloscope’s automatic measurement system to enable quick and repeatable analysis of power quality, input capacitance, in-rush current, harmonics, switching loss, safe operating area (SOA), modulation, ripple, magnetics measurements, efficiency, amplitude and timing measurements, slew rate (dv/dt and di/dt), Control Loop Response (Bode Plot), and Power Supply Rejection Ratio (PSRR). Measurement automation optimizes the measurement quality and repeatability at the touch of a button, without the need for an external PC or complex software setup. The Power Analysis measurements display a variety of waveforms and plots. The 5 Series MSO contains a number of ports which you can use to connect the instrument to a network, directly to a PC, or to other test equipment. Two USB 2.0 and one USB 3.0 host ports on the front and four more USB host ports (two 2.0, two 3.0) on the rear enable easy transfer of screen shots, instrument settings, and waveform data to a USB mass storage device. A USB mouse and keyboard can also be attached to USB host ports for instrument control and data entry. The rear panel USB device port is useful for controlling the oscilloscope remotely from a PC. 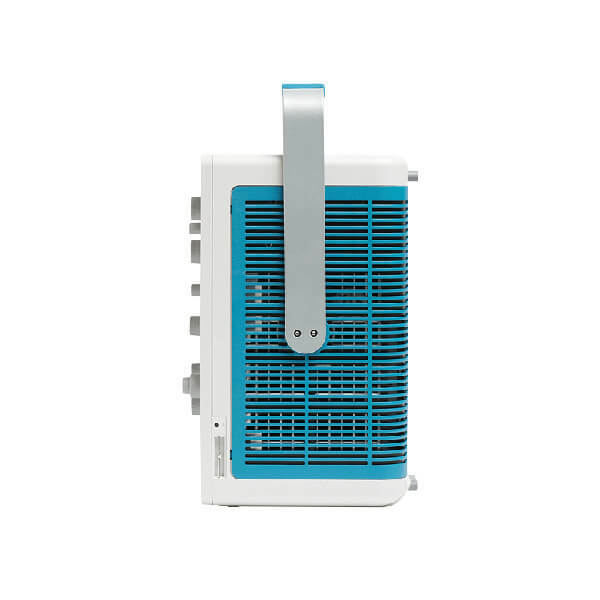 The standard 10/100/1000BASE-T Ethernet port on the rear of the instrument enables easy connection to networks and provides LXI Core 2011 compatibility. DVI-D, Display Port and VGA ports on the rear of the instrument lets you export the display to an external monitor or projector. The I/O you need to connect the 5 Series MSO to the rest of your design environment. Want to collaborate with a design team on the other side of the world? 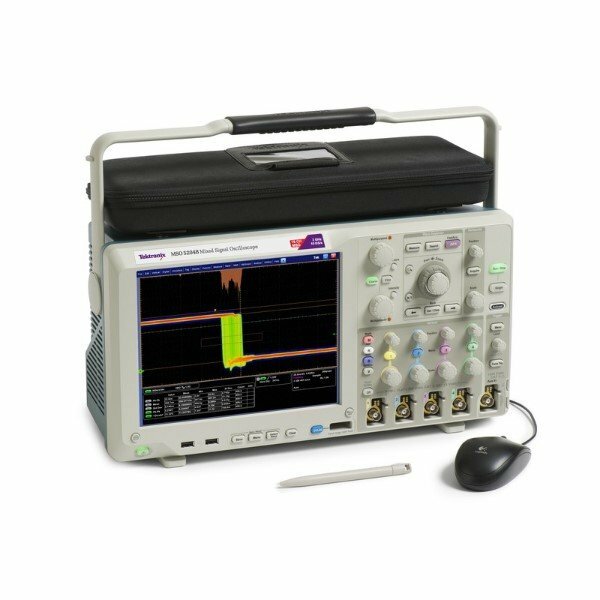 The embedded e*Scope®capability enables fast control of the oscilloscope over a network connection through a standard web browser. Simply enter the IP address or network name of the oscilloscope and a web page will be served to the browser. Control the oscilloscope remotely in the exact same ways you do in-person. Alternatively, you can use Microsoft Windows Remote Desktop™ capability to connect directly to your oscilloscope and control it remotely. The industry-standard TekVISA™ protocol interface is included for using and enhancing Windows applications for data analysis and documentation. IVI-COM instrument drivers are included to enable easy communication with the oscilloscope using LAN or USBTMC connections from an external PC. e*Scope provides simple remote viewing and control using common web browsers. 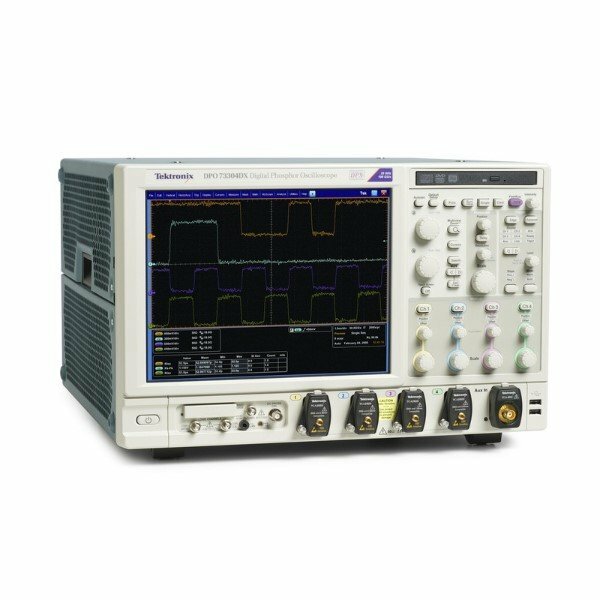 The 5 Series MSO contains an optional integrated arbitrary/function generator, perfect for simulating sensor signals within a design or adding noise to signals to perform margin testing. 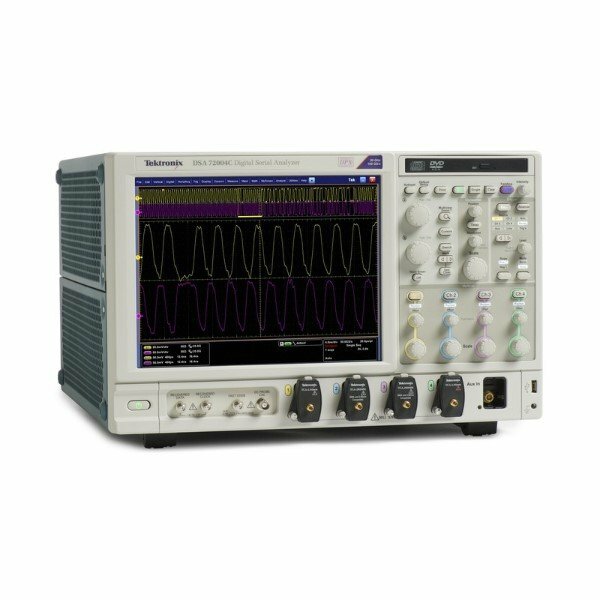 The integrated function generator provides output of predefined waveforms up to 50 MHz for sine, square, pulse, ramp/triangle, DC, noise, sin(x)/x (Sinc), Gaussian, Lorentz, exponential rise/fall, Haversine and cardiac. The arbitrary waveform generator provides 128 k points of record for loading saved waveforms from an internal file location or a USB mass storage device. 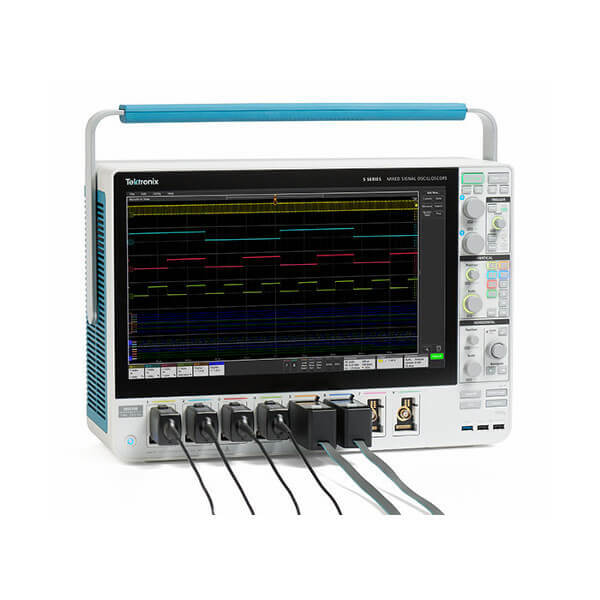 The 5 Series MSO is compatible with Tektronix’ ArbExpress PC-based waveform creation and editing software, making creation of complex waveforms fast and easy. The 5 Series MSO contains an integrated 4-digit digital voltmeter (DVM) and 8-digit trigger frequency counter. Any of the analog inputs can be a source for the voltmeter, using the same probes that are already attached for general oscilloscope usage. The counter provides a very precise readout of the frequency of the trigger event on which you’re triggering. Both the DVM and trigger frequency counter are available for free and are activated when you register your product. The optional 5-SEC enhanced security option enables password-protected enabling/disabling of all instrument I/O ports and firmware upgrades. In addition, option 5-SEC provides the highest level of security by ensuring that internal memory is clear of all setup and waveform data in compliance with National Industrial Security Program Operating Manual (NISPOM) DoD 5220.22-M, Chapter 8 requirements as well as Defense Security Service Manual for the Certification and Accreditation of Classified Systems under the NISPOM. This ensures you can confidently move the instrument out of a secure area. Graphical images and explanatory text are used in numerous menus to provide quick feature overviews. All menus include a question mark icon in the upper right that takes you directly to the portion of the integrated help system that applies to that menu. A short user interface tutorial is included in the Help menu for new users to come up to speed on the instrument in a matter of a few minutes. Integrated help answers your questions rapidly without having to find a manual or go to the internet. Differential serial bus? Be sure to check Step 7 for differential probes. Eight digital channels can be accessed on any FlexChannel simply by ordering a TLP058 logic probe, either with the instrument or separately. TLP058 8-channel general purpose logic probe. Includes accessory kit. R5 Standard Warranty Extended to 5 Years. Covers parts, labor and 2-day shipping within country. Guarantees faster repair time than without coverage. All repairs include calibration and updates. Hassle free – a single call starts the process.